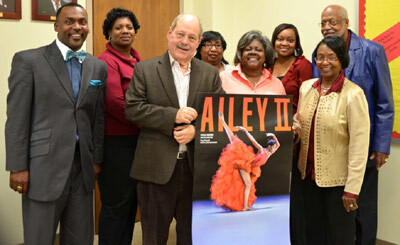 Busy planning for the Thursday, February 2, 2012 performance of the internationally-acclaimed Ailey II dancers in Clarksdale’s Civic Auditorium are members of the Coahoma Community College Lyceum Committee and Robert Canon, president of the Mississippi Festival Association. Organizers meeting Thursday to finetune plans include (from left) Dr. Greg Hudson, vice president of student affairs; Carol Brooks, athletic secretary; Canon; Rita Hanfor, assistant director of alumni affairs; Robbie Wallace, CCC business office; Yolanda Morton, academic counselor; Yvonne Stanford, director of libraries and Lyceum chair; and Henry Dorsey, retired fine arts chairman. The free 7 p.m. performance is sponsored by the Mississippi Festival Association, CCC, the National Endowment for the Arts, and other entities. In 1969, Alvin Ailey founded the Alvin Ailey American Dance Center in Brooklyn, New York with an initial enrollment of 125 students. Guided by the belief that dance instruction should be made available to everyone, Mr. Ailey joined forces with Pearl Lang in 1970 to establish the American Dance Center in Manhattan. In 1982, The Ailey School and its programs received accreditation from the National Association of Schools of Dance and continue to flourish under the co-direction of Tracy Inman and Melanie Person. A prestigious faculty of dance professionals trains over 5,000 students annually in our full-time Professional Division and Junior Division Programs for aspiring dance students, and Ailey Extension classes for the general public. Under the direction of Sylvia Waters, the School's junior company in residence, Ailey II, serves as a bridge between the School and the professional dance world. In December 2004, Alvin Ailey American Dance Theater, Ailey II, and The Ailey School moved to their permanent home, the Joan Weill Center for Dance, located in the heart of Manhattan's Theater District. The 77,000sq ft structure houses 12 climate-controlled studios, equipped with sprung floors, pianos, sound systems, and state of the art acoustics. It also is home to the 255-seat Ailey Citigroup Theater, physical therapy facilities, the Ailey Boutique, the library, student and faculty lounges, and administrative offices for the entire Alvin Ailey Dance Foundation.